Buy Anything Wholesale. The #1 Wholesale Guide! BONUS 1: DROP SHIPPING TUTORIAL. BONUS 2: BACK DOOR SUPPLIERS GUIDE. 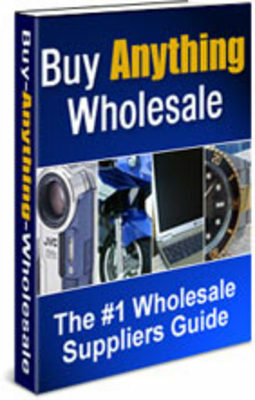 The #1 guide to REAL wholesale suppliers, manufacturers, liquidators and drop shippers. "Find A Wholesale Supplier For Any Product You Want In Just A Few MinutesAnd Pay Up To 80 Below Wholesale Prices!" What ever it is that you are looking for, whether it be brand name consumer electronics, clothing, auto parts, pet supplies, bicycles etc....you are about to find out exactly where and how to get it. *These are ACTUAL prices from just some of the suppliers I was able to find through the "sources" I'm about to share with you. These prices were found on May. 7 2005 and are subject to change at any time. If you are interested in getting your hands on the products you want at the lowest possible prices AS SOON AS POSSIBLE, this letter is for you. Why? Because I'm about to teach you exactly where and how to find real wholesale suppliers, manufacturers, and drop-shippers for any product you want in just a few minutes and pay up to 80 below wholesale. No searching through hundreds of irrelevant and outdated links. No fake suppliers whose prices are too high. No more wasted valuable time. Who am I to make these bold statements? What makes me an "expert" on finding wholesale suppliers? Let me tell you straight away, I'm no "guru" or "expert". I'm just a regular person, like you. But, what makes me different from you, is the fact that for the past 3 months I've been extensively researching ways to find wholesale suppliers. I have interviewed over 50 eBay power sellers from all over the world (U.S.A, Australia, Japan,Canada etc.) and got them to reveal exactly where and how they get their hands on the hot and profitable products they sell to make tens of thousands of dollars per month. I have bought exactly 26 wholesale lists (expensive!) from my competitors. 80 of the information was useless. I took the remaining 20 of useful information and threw it into MY guide. I have contacted and dealt with over 500 suppliers and can now say I am a pro at negotiating with even the most stubborn suppliers. As you can imagine, Ive learned A LOT from all this research. Ive done all the leg work. Then, I stuffed everything into a nice and simple, easy to read, straight to the point, no fluff, no B.S. wholesale guide. If it is sold in stores it can be bought from a wholesale supplier. This means that what ever it is that you are looking for, you can find a wholesale supplier for it...you just have to know where to look. Successful online sellers (eBay powersellers, Yahoo sellers, website owners etc.) can find a wholesale supplier for any product in just a few minutes. They don't need to spend weeks searching through the Internet just to find a supplier, because they know exactly where to look (soon, you will too). Most real suppliers will provide drop-shipping at no extra charge, while most fake online "drop-shippers" will charge you an extra fee for the service on top of their already high prices. There is a ton of people claiming to be real wholesalers but they're really middle men. These people buy their products at wholesale prices, then, they mark up the prices by 20-40. The marked up prices are still below retail, BUT well above the actual wholesale price. Hint: don't deal with these people. Sometimes the only way to make money selling something on the internet is to buy the products you sell at prices below wholesale. This is because products sold on the Internet are sold well below retail prices (sometimes as low as wholesale). I have also learned that most wholesale lists (I bought 26) give you no helpful advice on what to do with the information you get when you buy them. There is no advice on dealing with suppliers. No advice on starting with no money. All they give you is a bunch of links and you are on your own! It does not matter if you sell a gazzilion dollars worth of products, what matters is how much of that money you keep (profit). This is why it is so important to buy your products at the lowest prices possible (below wholesale): the less you pay for your products the more money you get to keep when you actually sell the products. How to easily find a wholesale supplier, manufacturer, or drop shipper for virtually any product you want...in just a few minutes. How to get your products for up to 80 below wholesale prices (imagine the profit margins!). Simple methods to getting around a supplier's minimum order quantities. The amazing secrets behind backdoor suppliers...how to get your hands on the really prestigious items like real Rolex watches, without having a dealers license. How to start with no money or products to sell...you can start virtually from scratch (a must if you are on a tight budget). How to choose the perfect product to sell. Learn which products will bring in the biggest profit margins. Just for fun...exactly how wholesale lists are made. You can make your own wholesale list in under 10 minutes. Simple ways to dramatically increase your profits, without working any harder or raising your prices. Things to watch out for (there are a lot of ways to lose money on the internet, especially if you dont know what to watch out for). What to do when a supplier refuses to give you samples. What to do when a supplier accepts only one kind of payment method. How to NOT get ripped off by the many con artists and scumbags. The simple truth about drop shipping, and how easy it is to find a reliable drop shipper. It's more simple than you think. The one irresistible offer you can make a supplier to make them forget about those large minimum order quantities. They will love you for it, and will want to do business with you again and again. The most important thing of all...You can find a supplier for ANY product you want! What product do you want? Shoes? Clothing? Electronics? Weird gadgets? Fish supplies? Computers? Travel mugs? Roler blades? Hi-tech digital computer pens? How about hair bands? Sports equipment? Musical instruments? Sewage treatment plants(yes, you can get that too :)? The point I'm trying to make is that whatever product you are looking for, you will find a reliable supplier for it using the "Buy ANYTHING Wholesale" guide. And you will learn much much more (over 40 pages more!) of extremely valuable information and advice! Remember, I've spent literally hundreds of hours researching the best possible ways of getting products for wholesale prices. I've interviewed over 50 eBay power sellers, bought 26 wholesale lists, and contacted over 500 wholesale suppliers, manufacturers and drop shippers. I've spent countless sleepless nights sifting through all this information, getting rid of the junk, and keeping only the best of the best. The final result is a no fluff, straight to the point wholesale guide, chuck full of ONLY the cream of the crop resources, information and advice. So, how much is all this information worth to you? How much is the ability to find a supplier for anything, anytime you want, worth to you? With my guide you can find a supplier for ANY product you want (you can find a supplier for nike shoes, cell phones and millions of other products). But I still sell my guide for only $37.95. Learn everything you want to know about drop shipping, drop shippers and how to properly use drop shipping to your advantage. Learn to use over seas drop shippers to your advantage. Exactly where and how to find drop shippers for virtually any product you want. Methods to insure your drop shipping is done right. Common mistakes to avoid if you really want to succeed with drop shipping. As you may already know, some products are extremely hard to come by for resale purposes (even if you have the money to afford a large order). This guide teaches you exactly how, where and what to do in order to get your hands on those extremely hard to find but HOT and profitable products. Learn the same methods used by Platinum power sellers to get their hands on the insanely profitable products they sell. Start contacting real suppliers for the products you want in just a few minutes after you download the "Buy ANYTHING Wholesale" guide! I am extremely confident that you will absolutely love the "Buy ANYTHING Wholesale" guide, because I have spent a lot of effort making my product live up to the claims I make on this website. GUARANTEE: Get the "Buy ANYTHING Wholesale" guide right now and read it over. Try the information out. If you are for any reason at all not 100 percent satisfied with the Buy ANYTHING Wholesale guide, send me an email within 30 days after purchasing, and I will personally refund every penny of your money, no questions asked. It's as simple as that. REMEMBER: The guarantee means that if you feel the "Buy ANYTHING Wholesale" Guide does not deliver on the promises made on this website you get your money back. So if your worried about your money, don't! Because if my guide doesn't deliver you get your money back. You have absolutely nothing to lose. With the above guarantee, the risk is 100 percent on me. So why not give my guide a try right now? P.S. If you came to this website looking for information on finding wholesale suppliers, this guide is for you. No other wholesesale information product offers such valuable, in-depth, no fluff insight on this exciting topic. With this guide, you will be able to find a supplier for ANY product you want, be it computer monitors, NBA jerseys, beads, scooters, etc.. Remember, ANY product you want. P.S.S. If you don't live in the US, don't worry this guide works all over the world. So if you live in Australia or Spain or the Philippines this guide WILL work for you. P.P.P.S. There is absolutely NO RISK on your part with my Money Back Guarantee. You simply can't lose. If you don't like the guide, you get your money back...it's as simple as that. P.P.P.P.S. The sooner you get the "Buy ANYTHING Wholesale" Guide, the sooner you will be able to find a supplier for the product(s) you want.